So I found another ThinkGeek store. If you're looking for the best Hogwarts or Post-Apocalyptic goods, look no further, for Crabtree Valley Mall in Raleigh has all your needs covered! I was waiting to get a charger for my phone when I stumbled upon the ThinkGeek store inside the mall. 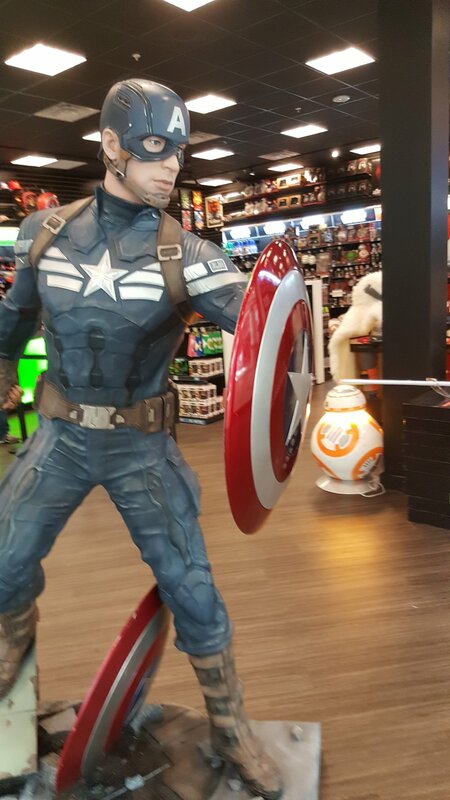 Of course I took photos with Captain America, and chatted with the manager who told me about a joker bust he was getting in the mail soon. If you're a geek, or you think like one, you need to go to one of the ThinkGeek stores. At the end of my last post, I mentioned a pool party. CouchSurfing.com holds events, and my host meet several other couchsurfers and subsequently became friends with them. We went off to a house party at Ben Couchsurfing's (his name in my phone) apartment complex. A kind face when traveling is most often friendly, let go and have fun with people you may not see again! Then I traveled down to Orlando and met my cousin, Michael. His last name is suspiciously similar to mine, if not the same. He's a software engineer and a huge geek. We tried out Crossfit, and innertubed down a river 2 hours away before I drove off into the sunset. I took the liberty of crappily editing some GoPro footage of the trip, check it out here! The next post will involve a long nap, some sparks, and NOLA magic. Stay tuned!